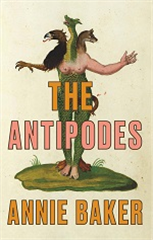 The Antipodes takes place in a static, windowless room with office chairs behind which are stacked many boxes of seltzer. This could be a soulless writers room, a marketing research discussion room, or even one of those rent-an-office conference spaces available in communal office complexes. The location is specifically nondescript to allow the strange goings on of Baker’s play shine. Strange goings on of both the occult and Office Space varieties bleed through the mundane to unsettle the lives of everyone involved. This play is about the stories we tell each other and the stories we’ve heard. All human stories are rooted in an ancient tradition of sharing what we know and what we don’t understand. Baker carts this ancient art into the contemporary light of day. Her characters discuss their current assignment while trading personal stories of sexual misadventure, horrifying revelation, and office politics. There are several moments in this play that depict and discuss bodily fluids. These aren’t gory moments but they aren’t polite either. These moments are a direct product of behavior that any HR office would flag as unprofessional. The Samuel French website says that the cast requires “7m, 2w” but a clever director could cast the roles of Sandy or Danny anywhere on the gender spectrum. These characters are given the flimsiest of backstories in order to keep everyone, cast and audience, in the present moment. Character ages are provided in the script but race is not. Baker states, “ I worked off the assumption that both Eleanor and Adam were hired due to pressure from HR.” She doesn’t explicitly say they were diversity hires. It could mean that Adam is someone’s unqualified nephew. It does not have to mean that they are the only people of color in the room… Even though that is what happened in the off-Broadway version. It doesn’t have to be that way in yours. Annie Baker’s other plays include The Flick (Pulitzer Prize), John, The Aliens (Obie Award), Circle Mirror Transformation (Obie Award), and an adaptation of Anton Chekhov’s Uncle Vanya. Her plays have been produced at more than two hundred theaters throughout the U.S. and in more than a dozen countries. She is the recipient of a MacArthur Fellowship, Guggenheim Fellowship, Steinberg Playwright Award, American Academy of Arts and Letters Award, and the Cullman Fellowship at the New York Public Library. The Prisoner is based on an experience writer/director Peter had when he visited Afghanistan before the Soviet Invasion in 1979. He says that he saw a man serving his prison sentence from outside the prison. This man’s punishment was to live in the weather and sun until his sentence was up. Rather than inquire into this man’s criminal past, Brooks imagined what this man’s life was like as a prisoner and an Afghan. These imaginings became The Prisoner. This play is not well written or realized on paper. Scenes are brief, lasting one or two pages only, and underdeveloped. Dialogue is used to explain what we have already been shown. The focus of all characters is to express heightened emotion. Opportunities to draw insight into the human experience are ignored in favor of emotional violence. The Prisoner is a frustrating read. It is unclear if Brook and Estienne have done proper research into Afghan culture. The Prisoner’s sentencing is made to parallel the Buddha’s transformation to enlightenment but Brook’s writing stops short of character growth. A better understanding of Brook and Estienne’s writing process can be gleaned via this interview. 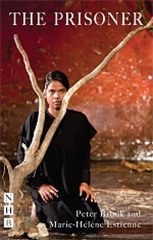 The Prisoner opened at Théâtre des Bouffes du Nord, Paris, in March 2018, before an international tour which included performances at the Edinburgh International Festival, the National Theatre of Great Britain, and Theatre for a New Audience in New York. Links to playwright bios are found by clicking their names just above. The Painted Rocks at Revolver Creek incorporates the art and life of Nukain Mabuza but should not be interpreted as biographical. In this play, a young African boy named Bokkie (later Jonathan Sejake) assists Mabuza in his art. Mabuza creates a visual rendering of his life through apartheid only for it to be rendered obsolete by an Afrikaner housewife on whose land the art resides, Elmarie Kleynhans. The Painted Rocks at Revolver Creek confronts the deep seated racism inherent in the displacement of African natives from the land of their birth by white South African landowners. Erasing native art was a step that South African colonizers took to erase African identity and claim to ownership. By telling this fictional story based on fact, Fugard aires the sins white South Africa would prefer to be forgotten. Reading this play is like reading an artist’s manifesto. We become intimately aware of Mabuza as an artist in the act of creation. This intimacy is broken by Elmarie’s appearance. White readers are made aware of their infiltration into the Black artist’s work. Elmarie, our representative, callously thrusts her presence into Mabuza’s private ritual. She has decided that ownership of the land on which Mabuza creates entitles her to ownership of Mabuza’s privacy, of his creation. We the readers must come to terms with Elmarie’s presence in Mabuza’s life and, in turn, our own consumption of Black culture. The Painted Rocks at Revolver Creek is short and requires only four actors (3 black males, 1 white woman). All of the roles are given opportunities to delve deep into the human experience. The adult male characters have dramatic, poetic monologues. Bokkie is an innocently precocious little boy. He’s a kid who values truth above adult racial politics. Elmarie, the female character speaks plainly about her racist beliefs. The actor in this role will need to be confident in their own bias as rehearsal and performance will not be the place to examine the actor’s personal journey. Nukain Mabuza has a website but it wasn’t loading as of 4/2/19. It is worth attempting to view the artist’s site to see his artwork. It is stunningly beautiful. Pretoria-based artist JFC Clarke took photographs of Mabuza’s art and created the website. Two books about Mabuza (The Home of Nukain Mabuza, Leopardstone Press, 2001; The Painted Stone Garden of Nukain Mabuza, Leopardstone Press, 2013) are available to learn more. Athol Fugard has been working in the theater as a playwright, director and actor for more than fifty years. His plays include Blood Knot, Boesman and Lena, “Master Harold”… and the boys, The Road to Mecca, My Children! My Africa!, Statements After an Arrest Under the Immorality Act and Valley Song. 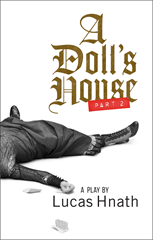 Boston’s Huntington Theatre Company produced A Doll’s House, Part 2 from January 4 — February 3, 2019. It was well received by the community. At first reading, I was unaware that A Doll’s House, Part 2 was a comedy. On my second reading, I was more aware of the play’s more absurd moments but still didn’t perceive it as a comedy. Hnath writes about a woman’s right to a life free of marital enslavement. Women are still struggling for marital, parental and financial equity. Sure, A Doll’s House, Part 2 contains comedic moments but should not be considered a comedy. If anything, it’s a dramedy: a play so serious that we must laugh or else we’ll never stop weeping. The set design for Doll’s House, Part 2 is simple. We’re presented a sparse room. This play could be performed on an expensive set or even in the room of an industrious theatre-maker’s home. Interested Cambridge thespians could easily perform it in The Democracy Center for a fraction of the cost of a local theater space. The opportunities abound. There are four characters in this play (3w, 1m). Each character gives at least one juicy monologue. The dialogue is fast-paced and frequently witty. A Doll’s House, Part 2 passes the Bechdel Test. Lucas Hnath’s plays include Hillary and Clinton, Red Speedo, The Christians, A Public Reading of an Unproduced Screenplay about the Death of Walt Disney, Isaac’s Eye, and Death Tax. He is the recipient of numerous awards, including the Kesselring Prize, a Guggenheim Fellowship, the Whiting Award, an Outer Critics Circle Award, the Steinberg Playwright Award, an Edgerton Foundation New Play Award, an Obie Award, and the Windham-Campbell Prize for Drama. He is a resident playwright at New Dramatists, a member of Ensemble Studio Theatre, and a New York Theatre Workshop Usual Suspect. 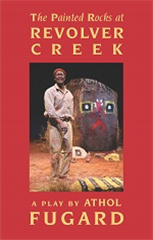 This entry was posted in Listings and tagged A Doll's House Part 2, Annie Baker, Athol Fugard, Kitty Drexel, Lucas Hnath, Marie-Hélène Estienne, New York City, NY, Peter Brook, TCG, TCG Books (Theatre Communications Group), The Antipodes, The Painted Rocks at Revolver Creek, The Prisoner, Theatre Communications Group by Kitty Drexel. Bookmark the permalink.